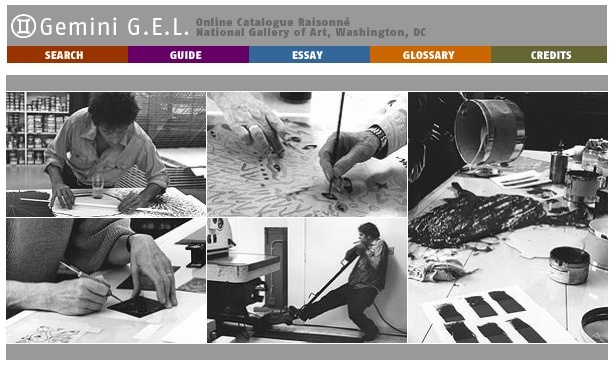 Last month it was announced that the National Gallery in Washington D.C. was to launch a newly expanded version of the Gemini G.E.L. (Graphic Editions Limited) online catalogue raisonné. Gemini G.E.L. was a Los Angeles-based print and sculpture workshop, operating between 1966 and 2005. The online catalogue holds records and images of 2,069 editions produced by the workshop, with 333 of those having been newly introduced to the expanded version of the raisonné. Gemini have worked with some of the most important artist of our time, which includes the likes of Jasper Johns, Robert Rauchenberg, Susan Rothenberg, Roy Lichtenstein, John Baldessari and Vija Celmins. Gemini was well known for it's eagerness to explore and experiment with new technologies and printing processes, which made it such a draw to top level artists. The new expansion to the catalogue charts the years 1997 to 2005, which saw artists such as Richard Serra, Ellsworth Kelly and Bruce Nauman adding to their print ouvre, but also artists like Cecily Brown, Chris Burden, Robert Gober and Brice Marsden joining the Gemini ranks. As well as a brilliant online collection of works, the catalogue also presents expanded and revised essays about the workshop, the artists that they worked with and the contribution that they have made to contemporary art. Any print fans are sure to find something fascinating to get their teeth into. The catalogue can be found on the National Gallery of Art website.